The usd to cad currency pair continued in bearish tone yesterday, with a solid down day, making four in a row since the top reversal of last week, and indicating a change in direction for the currency pair. The only point to note on yesterday’s chart, is that the opening price for the morning was gapped up, so from a technical perspective, the strong donwards move has been “broken” in the sense that we expect lower highs and lower lows in any move, for it it to be considered intact. 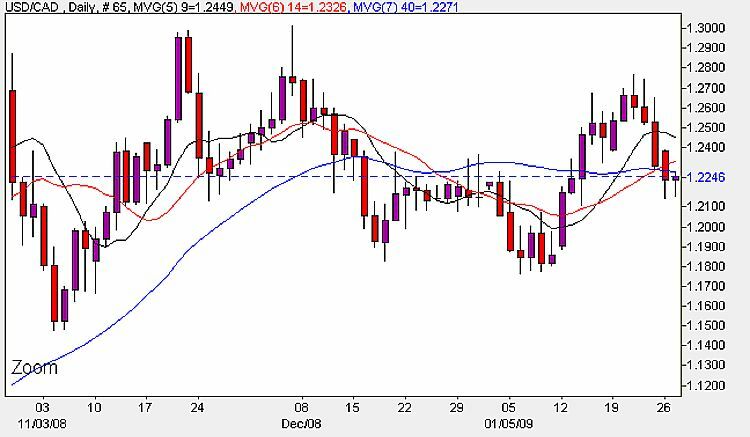 The pair have also crossed the 9 day and 14 day moving averages with the 40day beginning to turn. My suggested strategy for today would be to try small short positions with a stop above 1.3020. In the last few months we have seen extreme volatility in the usd to cad pair, so please use wide stops for trading this currency pair. This afternoon we have two items of fundamental news, firstly we have CB consumer confidence at 3pm (UK time ) in the US, and later in the day at 4 pm Bank of Canada Governor Mark Carney is due to speak. As head of the central bank, which controls short term interest rates, he has more influence over the nation’s currency value than any other person, so any comments will be scrutinized as they are often used to drop subtle clues regarding future monetary policy. Trading on the USD/CAD could be quiet this morning as it waits for the news this afternoon. The short term is bearish, with a sideways move possible in the medium term, and parity on the horizon again in the longer term.